Working out your chest and triceps muscles on the same day, or in the same exercise, can provide several benefits. In addition to shortening your workout time, you can increase the difficulty of exercises, and increase muscular strength and endurance in the triceps. The close grip bench press and bar dips are two great exercises that allow you to completely target both the chest — pectoralis major and minor — and triceps muscles. In any chest-press motion, the triceps are activated because they are the muscles responsible for extending the elbow. When pressing or pushing, the arms go from bent to full extension, which straightens the elbow joints. Chest-press or push exercises will cause muscular fatigue in the triceps due to their role in the movement. When doing chest and triceps workouts on the same day, or at the same time, the triceps muscles will tire out before the chest muscles due to the triceps being smaller. Additionally, if the triceps become fatigued, it will make the chest-press exercises more difficult to perform. Close grip bench press is a modification of the traditional bench press exercise. The difference is that the hands are positioned at a shorter distance from each other. Typically in a traditional bench press, the hands are lined up at least shoulder-width apart. In a close grip bench press, the hands are lined up no more than 10 to 12 inches apart. This narrower grip forces the triceps to do more work and takes off some of the stress on the chest muscles, compared with the traditional bench press. 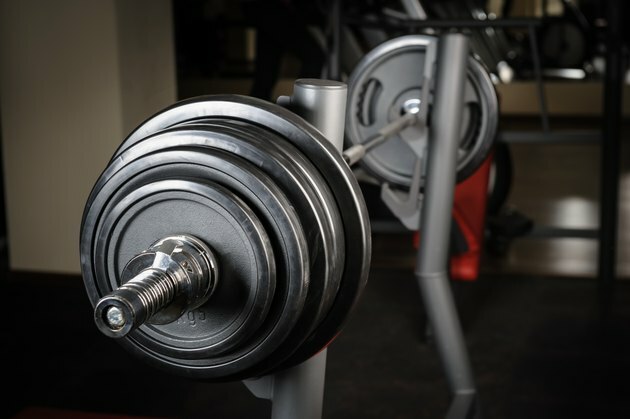 After you place your hands, lift the bar off the rack, keep your wrists locked so they don't bend forward or backward, bring the weight down until your elbows come to an even level with your shoulders and push back up. Do not touch your chest or lock out your elbows. Perform this exercise with a weight that allows you to do three sets of eight to 12 reps.
Bar dips can be modified to work more of the chest muscles than the standard triceps dips. To work more of your chest muscles in this exercise, lean forward about 90 degrees and lower your body until the chest is even with the bars. The forward leans place more emphasis on the chest in addition to the triceps, whereas the standard triceps dip, in which your torso is upright, almost exclusively isolates the triceps. To begin, grab each bar with your hands and use a firm grip that keeps your wrists solid without rolling or bending. Push straight up so that your body weight is balanced on your hands. Lean forward 45 degrees and lower yourself until your chest is parallel with the bars. Keep your elbows next to your body and your hips straight to prevent any rocking. Perform this exercise for three sets of eight to 12 reps with your body weight. Training your chest and triceps at the same time is a more advanced method of weight training. Seek advice from a personal trainer before beginning these exercises. A personal trainer will evaluate you to make sure you are conditioned enough to train in this method. Additionally, he will teach you proper form and any related safety precautions.